CARDIOVASCULAR DISEASE IS THE NUMBER ONE CAUSE OF DEATH IN THE WESTERN WORLD AND A GROWING CONCERN IN DEVELOPING COUNTRIES. There is growing epidemiological evidence that common infections that cause inflammation, such as periodontal disease, may contribute to the development of coronary artery disease and stroke. Many chronic illnesses previously attributed to genetics and environment are now being recognized to have, as causal or contributing factors, bacteria, viruses, and parasites contribute to chronic human diseases. For example, peptic ulcers were attributed to stress and diet, but we now know that peptic ulcers are caused by the bacterium Helicobacter pylori. This discovery provided effective new ways to treat this painful disease. The Donald P. Shiley BioScience Center is poised to make substantive discoveries relating infection and inflammation to cardiovascular disease. The mission of the Donald P. Shiley BioScience Center is to understand the role of microorganisms in cardiovascular diseases, and to use these discoveries to improve public health. This is a unique emphasis: although there are many cardiovascular research centers, none is focusing on the connection between infection and inflammation. 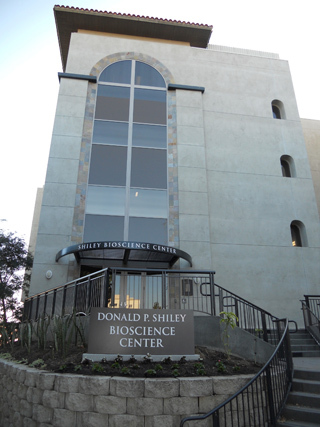 The Donald P. Shiley BioScience Center will direct efforts to two general areas: the first is the metabolic syndrome: obesity, atherosclerosis, hyperlipidemia, and hypertension. There is increasing evidence that bacteria play a contributory or possibly causal role. The second area will address host-pathogen interactions that lead to autoimmunity directed against the heart. Inflammation caused by chronic, low-level infection can increase the production of immune-response hormones that cause white blood cells to adhere to the endothelial cells lining the blood vessels, releasing factors that promote hypertension and atherosclerosis. The immune response hormones also promote hyperlipidemia and obesity, eventually leading to insulin-resistant diabetes. Periodontitis is one type of chronic infection that causes increased production of immune response hormones, and epidemiologic studies show a strong association with atherosclerosis and diabetes. The bacteria that cause periodontitis can also invade the endothelial cells lining the coronary arteries, possibly contributing to the formation and rupture of arterial plaques that cause myocardial infarctions. 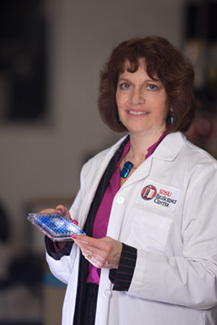 The Donald P. Shiley BioScience Center has begun research to study the periodontal-cardiovascular connection at cellular, whole-organism, and public health levels. We are undertaking a study of periodontal disease and vascular function in Native American young adults and in Hispanic high school students in City Heights. If our hypothesis is correct, we will be the first to directly demonstrate a causal relationship between oral hygiene and the development of atherosclerosis. The ramifications are profound: the low-cost intervention of dental care and education could prevent the development of coronary artery disease and stroke two decades hence, saving tens of thousands of lives and billions in health care dollars. "Obesity is epidemic in the USA but is increasing in prevalence worldwide. About 60 million American adults, or 30 percent of the adult population, are now obese, which represents a doubling of the rate since 1980." The rapid rise even in third-world nations suggests an infectious cause, and recent evidence implicates a microbial basis. Investigators at Washington University showed that germ-free mice could eat more food and gain less weight than mice that had restoration of their intestinal bacteria. Subsequent work has shown that the specific bacteria that colonize the gut interact to metabolize food and enhance absorption of fats from the intestine into the bloodstream. This is likely to be the case in humans, that some bacterial populations enhance food utilization to a greater degree than others. In settings where food is scarce, it would be advantageous to be able to absorb every last calorie through the help of these bacteria. However, in an environment of nutritional abundance, these intestinal bacteria could contribute to obesity. The obesity epidemic over the past two decades suggests that these bacteria have become widespread in the population. There is hope, then, that one could colonize the gut with bacteria that would diminish nutrient uptake. Perhaps one day we could have a Big Mac with special sauce laden with "skinny-making" bacteria. For the present, however, we are facing an epidemic of obesity that may have a microbial contribution. Obesity is the greatest risk factor for type II diabetes, and both of these are major contributors to atherosclerotic heart disease. One of the first goals for The Donald P. Shiley BioScience Center, once the next research floor is built out, is to recruit investigators to focus on this problem. An important example of host-pathogen interactions that lead to autoimmunity against the heart is Chagas disease, in which patients develop dilated cardiomyopathy due to infection by a protozoan parasite, Trypanosoma cruzi. The host immune response is part of the disease, because antibodies to cardiac myosin attack the muscle and cause heart failure. Chagas disease affects 16-18 million people in the Americas. The trypanosome is spread by triatomine insects, often called "kissing bugs." Various animals including rats and dogs serve as a reservoir source of the parasite, which can also be spread by blood transfusion and organ transplantation. Generally viewed as a problem affecting tropical regions of Mexico and Latin America, the incidence in the USA is expected to rise with global warming. Understanding the host immune response is necessary in order to develop therapy for patients with chronic Chagasic cardiomyopathy. It will also be important for vaccine development, since the vaccine must not elicit an autoimmune reaction. Coxsackie virus also causes cardiomyopathy, and the host immune response is an important aspect of the disease process. These two diseases exemplify the pathology of infection leading to chronic heart failure mediated by autoimmune processes. 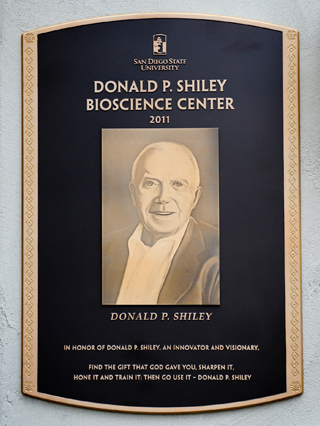 "The goals of the Donald P. Shiley BioScience Center for the next 10 years are to reduce the incidence of atherosclerosis by instituting basic oral care measures; manage obesity by modifying intestinal flora through probiotics; to develop vaccines for Chagas Disease and Coxsackievirus; and to develop new therapies for heart failure." Once completed, the Donald P. Shiley BioScience Center will house 10-12 faculty investigators and of 60-80 trainees including students and postdoctoral fellows. Both undergraduate and graduate students will be involved in all levels of research. Exposure of students to scientific research is an extremely important aspect of a scientific education, as it develops critical thinking skills, fosters curiosity and creativity, and provides practical skills that are valued by the biotech community in San Diego. In order to accomplish the research goals, we need to build out the remaining two research floors and recruit faculty to conduct research in the target areas. We will need to establish core facilities to support the research, which will be largely funded by the National Institutes of Health. Commercialization of discoveries is the most important vehicle for translating basic science discoveries into clinical applications. Therefore we envision a close alliance with the San Diego biotechnology community, possibly including housing incubator space for startup companies that arise from discoveries made in The Donald P. Shiley BioScience Center. 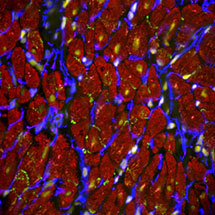 The Donald P. Shiley BioScience Center represents a new approach to heart disease and obesity, through an emphasis on the underlying processes of infection and inflammation. The close connection with biotechnology companies establishes a university model for rapid commercialization of inspired ideas and therapeutic discoveries. The Donald P. Shiley BioScience Center seeks to develop creative responses to the pressing health concerns of today.